Inspiring Bella Crafts: Sept 2 release day. Hello and welcome to Day 2 of our September Digital Stamp Release Showcase! On Saturday (1st September) Whimsy Stamps released this month's new digital designs, From then until 4th September the Whimsy Digital DT and Special Guests are showcasing these fabulous new goodies with a daily mini blog hop and I am part of today’s hop! Each mini blog hop has a new release prize hidden somewhere along the way and you have 24hrs to enter each prize draw. To be entered into today's mini blog hop prize draw, be sure to leave a comment on ALL of the DT's posts listed below by 12.00PM EST tomorrow. All winners will be announced on the Whimsy blog on 5th August. This is my Day 2 Release card for the digital release for Whimsy Stamps. 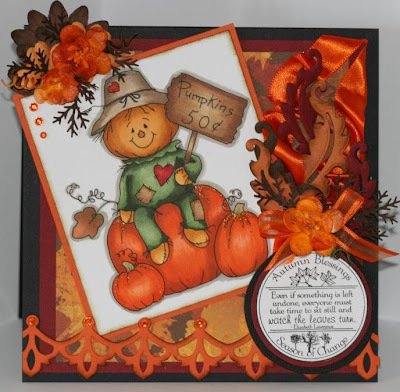 This is made using the new digital stamp from Whimsy stamps called Pumpkins Fifty Cents made by digital designer Crissy. Cause autumn is just around the corner, so I used some fall colors for this great digital stamp. I hope you click on the links below to check out the other Dt's wonderful cards that help show case the new wonderful digital images. Remember that the entire new release is available to buy right now from the Whimsy Stamps store along with all your Whimsy favourites. Thanks for stopping by and don't forget to pop back to the Whimsy blog tomorrow for more new release creations! Gorgeous!! Love the colors.. Your coloring is fantastic! Oh I love this! I love the sweet, cute Halloween images and this is adorable! Love this card!! Wow, this card is gorgeous! I like the border die you used along the bottom.